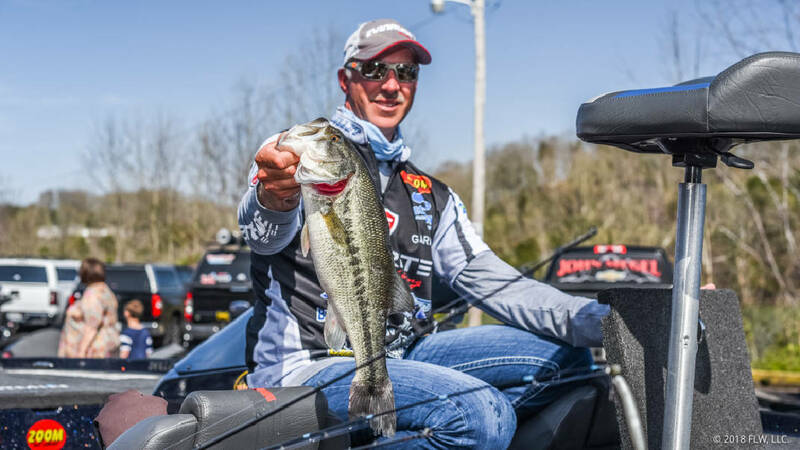 First-day leader Andy Morgan of Dayton, Tenn., also leads after the second day Friday in the FLW Tour bass tournament on Lake Cumberland in Kentucky. Andy Morgan of Dayton, Tenn., maintained his lead in the FLW Tour bass tournament on Lake Cumberland with a five-fish limit totaling 15 pounds, 12 ounces Friday. The three-time series angler of the year has 34-11 for two days in Kentucky, while second-place Darrel Robertson of Jay, Okla., has 33-5. The top 30 from the 180-pro field go back out today. Dayton's Michael Neal slipped out of that group Friday, finishing 50th at 26-0 and receiving $10,000. Alex Hester of Crossville, Tenn., finished 15th among the co-anglers at 20-4 and got $1,500. * Tennessee Wesleyan's baseball team is 26-17, 15-5 in the Appalachian Athletic Conference, after thrashing Truett McConnell 18-8 and 34-1 Friday. Dakota Phillips was 3-for-4 with four RBIs, Braden Mosley had five RBIs, Grant Lang had three RBIs and Tristan Clarke had two in the first game, and those four homered along with Collin Ridout and Tyler Halas, who was 3-for-4 and matched Phillips and Aloysius Cruz with three runs. Halas and Cruz had six and five RBIs in game two, and Clarke and Alfred Cruz added four apiece. The Bulldogs totaled eight homers, two each by Clarke and Aloysius Cruz, and Carson Bach pitched a one-hitter with eight strikeouts. * Bryan won 12-8 and 9-5 at Union (Ky.) and is now 32-10, 16-4 in AAC games. Lake Burris was 3-for-4 and scored three runs, Fernando Garcia was 3-for-5 with two RBIs and two runs and Rodney Tennie also had two RBIs in the first win for the Lions. Garcia homered and doubled and drove four runs in game two, when Wade Weinburger also homered and scored three times and David Scoggins had two RBIs. * Sewanee lost 21-6 to visiting Berry in Southern Athletic Association baseball Friday. Trey Akins was 3-for-4 with a homer, a double and two RBIs and Chris McNulty homered, doubled and scored twice for the Tigers (12-20, 6-13), while Riley Brandvold was 2-for-4 with an RBI and a run and Jared Demkowicz also homered. For Berry (24-12, 15-4), Tyler Calvert was 4-for-5 with two homers, four RBIs and three runs; Jacob Delk was 4-for-5 with a homer, four runs and three RBIs; Devin Post and Will Deems homered and had five and four RBIs. * Chattanooga State ran its softball win streak to 28 games with 6-1 and 4-0 TCCAA victories Friday at Dyersburg State, as Kaleigh Wynne pitched a four-hitter with nine strikeouts and Jenna Edwards added a three-hit shutout with 11 strikeouts. Shelby Penning was 3-for-6 with a triple, two RBIs and a run scored in the doubleheader for the 14th-ranked Lady Tigers (40-8, 25-1). Madison Crabtree was 2-for-4 with two doubles in game one, and Wynne was 2-for-4 with an RBI and a run while Katie Cheeseman was 1-for-2 with two walks and a run in the rematch. * The Covenant College softball team set a program record for wins in a season with a 2-0 defeat of Meredith in the USA South tournament Friday at LaGrange, Ga., but then lost 5-0 to Maryville. The Lady Scots (23-19) play in the losers bracket today. In their win, Sarah Huskey (7-2) allowed four hits and struck out seven batters in six innings and Joni Johnson pitched a hitless seventh for a save, and Shannon Schmitt tripled in a run in the first inning and then scored on an error. She was 2-for-3. Erika Mast was 2-for-3 against Maryville (27-11). * Bryan College lost 11-3 and won 3-2 in AAC softball Friday against visiting Brenau, whose Kelsey Payne from East Hamilton was 2-for-4 with a homer and two runs scored in game one and scored another run in game two, when Savannah Moore from Soddy-Daisy was 1-for-2 with an RBI double. Ashley Brown was 1-for-2 with two RBIs and Sydney Olander was 2-for-4 and scored twice for Bryan in the first game. In the Lady Lions' win, Kimberly McKernie was 2-for-3 with a double and two RBIs, Hannah O'Shields had the other RBI and Lindsey Dunn was 2-for-3, scored a run and pitched a six-hitter. * The University of Tennessee at Chattanooga had three top-10 finishers in the women's elite mile Friday at Western Carolina's Catamount Classic track and field meet: Brianna Nelson fifth, Emily Poole seventh and Sophia Neglia ninth. * Covenant lost 7-2 to North Carolina Wesleyan in the first round of the USA South women's tennis tournament Friday at LaGrange. Covenant (9-9) won 8-2 at No. 1 doubles with Annie DeLuca and Esther Eddy and 6-4, 6-2 at No. 1 singles with Aly Hall. The Covenant men had a bye and play in the semifinals today. * Covenant sophomore Nathan Hawkins repeated Friday his 77 from the first day of the USA South men's golf tournament and remained tied for 24th going into the final round today at Highland Country Club in LaGrange. * Becca Broadwick scored four goals and Madeline Perrigo had three plus three assists as Lee University routed visiting Shorter 19-2 in Gulf South women's lacrosse Friday. Brianne Schapira and Kaylyn Dillon also scored three times each, and Emma Hill had five assists and a goal for Lee (9-8, 3-5). * Tennessee Wesleyan beat visiting Brenau 27-0 in AAC women's lacrosse Friday. Mikayla Virden and Emily Waldroup scored six goals apiece, Virden with an assist and five ground balls and Waldroup with six ground balls and seven draw controls, while and Margaret Waite and Florence Andrieu had four goals each, Waite with two assists and 11 draw controls. Grace Passantino had three goals and three assists for TWU (10-4, 8-1).